It’s all smiles when you’re part of the DMA family! Sensory play at the October Autism Awareness Family Celebration. 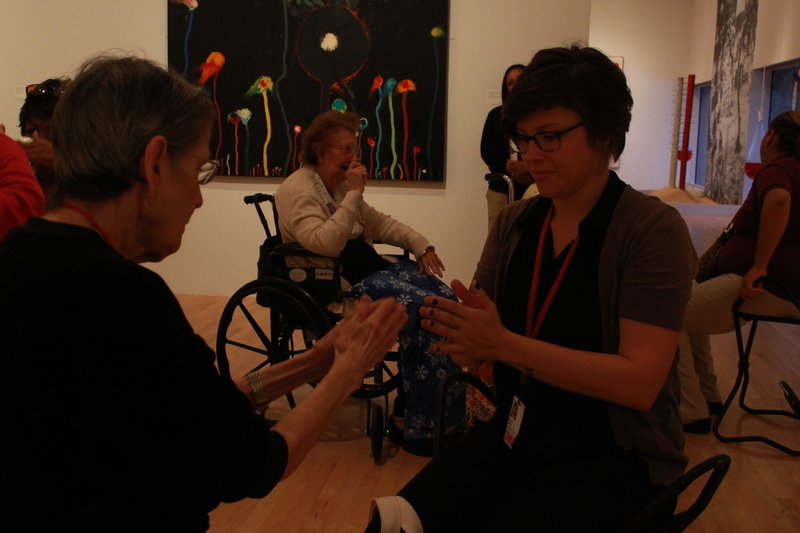 Meaningful Moments participant Sue and her granddaughter work on an activity in the galleries. We know there’s no one definition of family. For a friendly tail wag or nuzzle when we’re blue. And please know we’re so grateful to count you in ours. Some of our littlest family members meet our bluest family member, Arturo. Donna and Steve of our Meaningful Moments family decorate greek amphoras together. Members of our All Access Art family! Families know that teamwork makes the dream work. Drawing time together in Toddler Art. Today we are saying goodbye to a dear colleague and friend. Danielle Schulz joined the Education department three years ago and has charmed us all with her wit, dedication to excellent teaching, and bubbly personality. She is moving on to a new position at the Denver Art Museum, so we want to send her off with happy memories of all that she has accomplished here. And since she has spent the majority of her time in one classroom or another, we thought it only fitting to say goodbye with the best kind of school farewell we know–the yearbook Most Likely Awards. From using pool noodles with participants in wheelchairs to mimic movements in paintings, to cross-stitching astrological signs with visitors with Alzheimer’s disease, Danielle always went above and beyond to find an extraordinary way to connect to those with special needs. 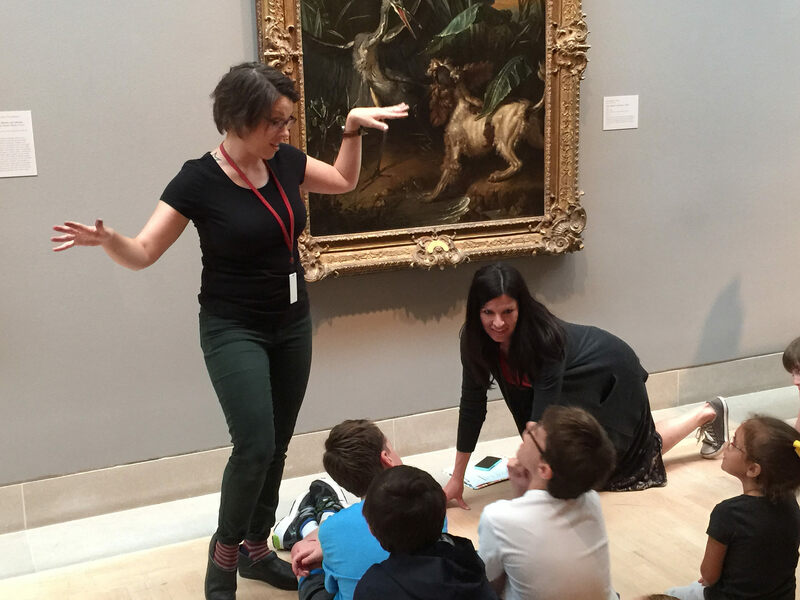 Danielle has a gift for listening and relating to visitors of all abilities and uses her talent to figure out how best to teach about artworks. 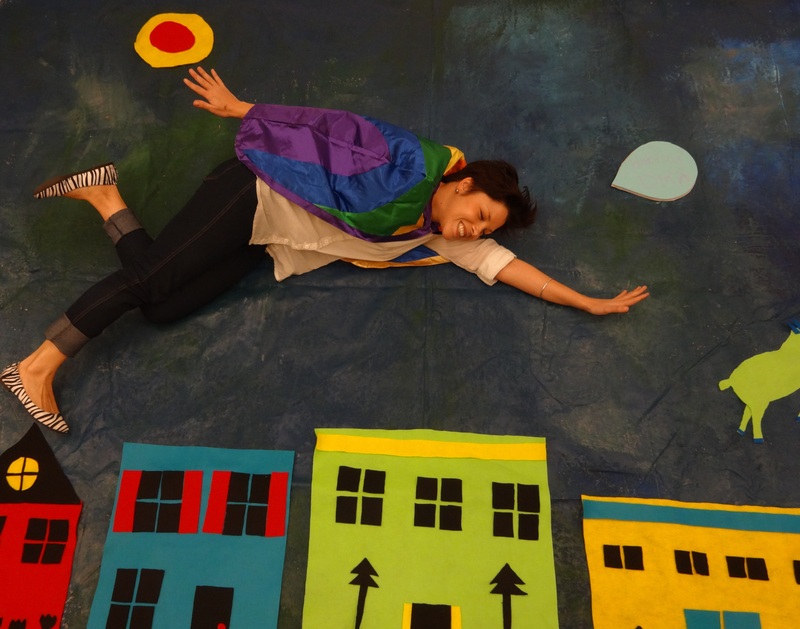 While teaching an outreach lesson at a local school for the Go van Gogh program, Danielle led a discussion with elementary students about the different materials artists use to create art. With a little boy sense of humor, one student offered up “poop” as a suggestion, to which Danielle deftly replied, “Some artists do use refuse to create art” without missing a beat! As the lead staff for coordinating the daily come-and-go for our busy summer art camps, Danielle supervised summer interns, set up studios for teachers, emailed parents, made parking arrangements, and all kinds of less-than-glamorous tasks that make summer camps smooth sailing. And oh the supplies–no matter what crazy material a teacher throws at her, Danielle can find it. Hundreds of plastic bags? Check. Toy motors? No problem. Lamp shades? Done. 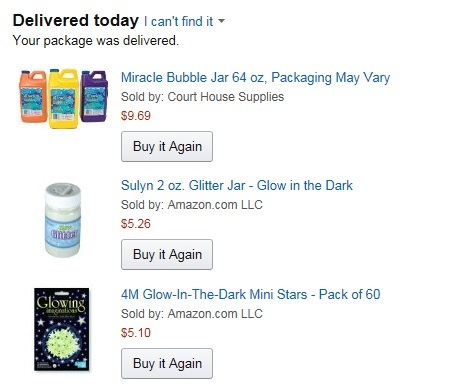 If you judge her by her Amazon shopping cart, you’ll know that this is one crazy, creative, out-of-the-box-thinking girl. Danielle is a phenomenal teacher, whether she’s performing for a group of babies, leading a group of high school students through the galleries, or having a conversation with a senior group from a care facility. She always goes the extra mile, searching for ways to really connect with visitors, considering their needs, and adding in her trademark sense of humor. 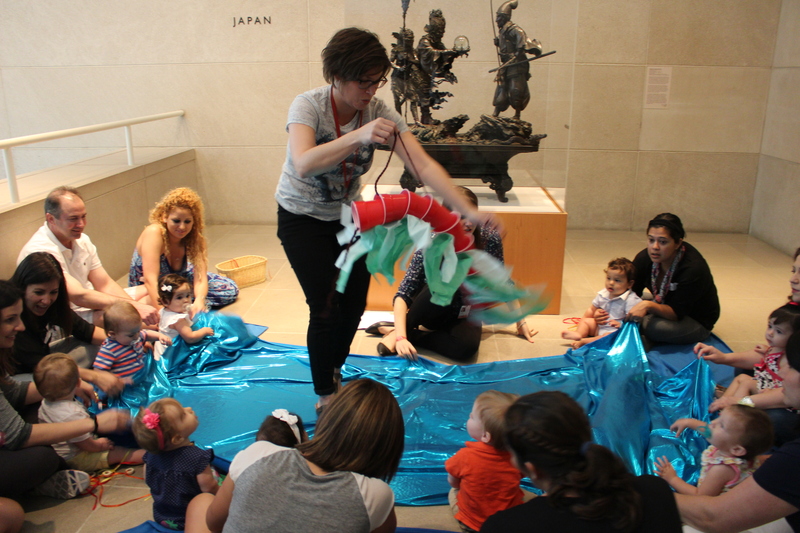 I’ve seen her perform the role of “Dragon King” for Art Babies class, wear a taco costume for a Late Night superhero tour, and bring in a treasured quilt from home for an access program–all in the name of helping visitors enjoy their experiences with art. Did we mention she acts? 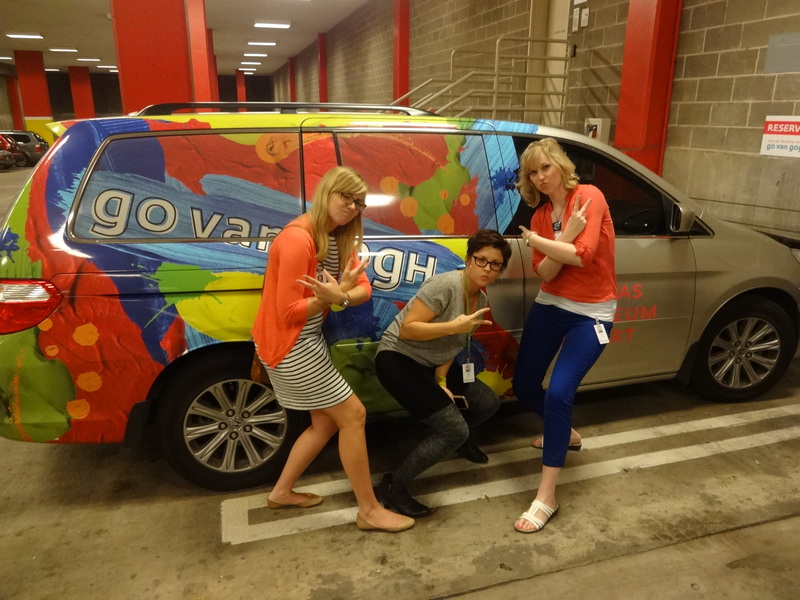 Several years ago, Go van Gogh went for a BIG opportunity that required us to make a short video selling our wonderful outreach program. Knowing that we needed to reeeally stand out to compete, we worked the whimsical angle, and Danielle spent an afternoon excitedly jumping out from behind artworks on camera. I don’t know how many times she jumped out from behind Nandi the Bull in our South East Asian galleries, but I do know by the time we were ready to submit our video, we had a fantastic (and definitely whimsical) representation of our program. The video went on to earn us $10,000. Without Danielle’s acting skills, teaching prowess, and overall great ideas and energy, we wouldn’t have had a shot. Someone get this woman an agent! Danielle’s passion for teaching with works of art and her love of people will propel her as high as her dreams will fly, and we wish her the best of luck at the Denver Art Museum. We are going to miss Danielle more than we can say, but are so excited for the new adventure that awaits her in the Colorado mountains. In July, we capped off another wonderful year of our Second Sunday partnership with an exhibition of our creations at the South Dallas Cultural Center. Also on display at the Center was a street art project created in collaboration with a group of teens at the Center’s summer program. The completed work, after a very long morning! Thank you, South Dallas families, for another wonderful partnership! We look forward to the creativity our next group will bring!